Faithwalk Aussies - Why Pay More? I want to start this page with an entry from a blog belonging to the friend of a friend. She has Canaan dogs and Collies and lives in Israel. It so sums up what a good breeder goes through when raising a litter of puppies. I couldn't have said it better myself!!! I included the link to her blog below that. I am sure that anyone who has spent any time looking for a new dog or pup has seen there is a tremendous variation in the price of a puppy. Let me try to shed some light into that. First of all, let me say there are various kinds of breeders out there. Some are in it for the money more than anything else. They may or may not love their dogs, but the first consideration is making money selling puppies. They may cut corners on the care of their dogs (not doing OFA, CERF/CAER or MDR1/HSF4/CEA, prch-PRA testing, feeding a cheaper food, and other such things.) Some of these breeders still charge quite a lot of money but it just doesn't go back into the care of the dogs. Then other breeders just breed any dog they can, not worrying about the quality or health of the dogs. Some may not be registered, or will have "papers" from some of the less respectable registries like Continental Kennel Club (CKC), American Pet Registry (APR), or other such places. Even NSDR, the National Stock Dog Registry doesn't hold the respect it used to. They may sell their dogs for less money, but sometimes you get what you pay for in that the dogs may have health or temperament issues, or may not even look like Aussies. Some breeders may have many breeds, and in truth, can not dedicate the needed time to really learning all they can about each breed. Then other breeders are truly dedicated to their chosen breed. They spend a lot of time, even years, studying every aspect of the breed, from pedigrees and history, to structure and breed type (how well a breed fits the breed standard of perfection), health, temperament, training, nutrition and so on. Many times these are called hobby breeders, but to me that almost sells them short as it is more than a passing hobby, but often a life long dedication to the breed. These are the good stewards of the breed and are the ones I recommend. These breeders will do all the necessary health testing for their breed. They will tell you what may be common in the breed and why testing is necessary. They will DNA all their dogs with AKC and/or ASCA. They will often raise pups in their homes to ensure the puppies get off to a great start, being handled daily and getting exposed to all the common household noises, smells and sights. They will make sacrifices of their time for these pups and do all they can to get them off to a great start. They feed the best foods and supplements, and pour their hearts into their dogs and puppies. Many will show their dogs in conformation shows, agility or other performance events, compete in stock dog competitions, or work the dogs on their farms or ranches. The dogs get to show what they are made of and that they are worthy of passing on their genes. THESE breeders are the ones I would prefer to support if I am looking for a new pup. They may charge more than some breeders, but it shows in the quality and health of the pups they produce. It does cost a lot of money to do all the health testing, to feed quality foods and do all that is necessary to breed really good dogs. They will produce the best puppies available. These breeders will also stand behind any pup they sell, by offering a lifetime of advice or support as needed, and in the event the dog can no longer be kept by it's original owner, the breeder will either take the dog back or help to find it a new permanent home. I will say you may want to beware of breeders who breed only for coat or eye color , or one other superficial trait, at the expense of all other qualities. Some of these breeders still charge a lot of money, and may try to appear "expert", but when you start asking about OFA or CERF testing, or other qualities, they may not be able to answer. I also recommend you ask what they hoped to achieve with a particular breeding. By that I mean what were their goals. Was it to correct minor faults and which were they, and preserve the good qualities of their lines and what are those. It's not that you can't buy from someone like that, but I personally wouldn't pay as much for such a puppy, as there is a higher risk of health or temperament issues and perhaps lower quality in the sense of how the dog meets the breed standard. Something else I hear some breeders say is "we just breed for family pets" as if it's an excuse not to try to have great quality dogs with the health testing done. Even if a breeder doesn't show their dogs, there is no reason they still can't strive to produce dogs that meet the breed standard, have great temperaments, and are health tested. To me, being a family pet is a very noble job for a dog, and it must have a good temperament and be healthy, so as to live a long life. Having good structure will also help, since it can remain active and sound a lot longer than a dog with poor physical structure. So even if a dog never sees the show ring or works stock, being healthy and sound is still quite important. I would also ask the breeder if they mind you visiting, even prior to choosing them as a breeder, much less before it's time to look at or choose puppies. By visiting, you can meet the parents and maybe some relatives, and get a feel for what the dogs are like to be around. You can also get a feel for what the breeder is like to deal with, since he or she will be your source for information and help after you get your puppy. Are the facilities clean and are the dogs clean, healthy, well groomed and friendly? Facilities may just mean the house, as Aussies do best being part of the family, not kept in kennels most of the time. Does the breeder as you as many questions as you ask him or her? That is often a clue as to how much they care about where their puppies go. One thing I will really stress is to avoid buying a puppy at a pet store. You will probably pay 2-4 times more than you would from a good breeder, and odds are very high your puppy was born in a cage at a large commercial breeding operation. The parents may live a poor quality life in the sense they don't have a lot of fun doggy things to do, often spending most or all of their time in cages. And, odds are high they have not had their hip and eye health testing done or been evaluated for other qualities such as temperament and how well they meet the breed standard. Buying from a home based breeder who is dedicated to the breed will give you the best chance of having a long lived, sound and happy companion who is beautiful on the inside and the outside! I should also add that many of the online puppy sale websites will also have puppies from less than great breeders. You can't JUST judge by price what kind of breeder it is, as I see some of these volume or"money" breeders charging quite a lot of money for their pups. They are often priced based on color, markings or eye color, or "champion lines" or other things they think raise the value of the dogs. But like some of the breeders I talked about above, they cut corners on health testing and other important things. So if you are paying a lot of money for a dog, make sure it's one from a breeder that really gives you value for your money, as that will increase the odds you get a great dog that will live a long and healthy life! These are just a few things to consider. Best wishes as you search for your next best doggy friend! I thought I would give some rough ideas of price ranges that are common among good breeders. You can expect to pay anywhere from $1000-$1500 for quality pet puppies. For top quality show puppies you may pay $1500-$3000, with the $1500-$2000 range being common in many parts of the country. 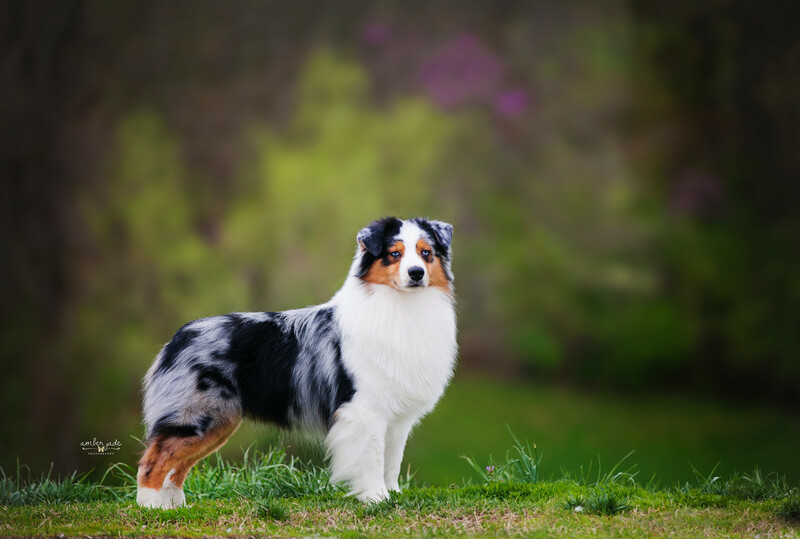 I should note that some of the backyard breeders or commercial breeders (cranking out a lot of pups just to make money) may also charge those prices, but you won't be likely to get the same quality in terms of how well the dogs meet the breed standard (looking like an Aussie and having proper structure so they stay healthy and sound all their lives.) You also won't be getting health tested lines (hips, eyes, etc) nor a breeder who has studied pedigrees in hopes of avoiding health problems while keeping good qualities. Pups coming from places that are mass produced also won't get the early handling and things like Puppy Culture, and that puts them way behind in development. I CAN'T STRESS ENOUGH HOW IMPORTANT IT IS TO BUY FROM BREEDERS WHO DO HEALTH TESTING, PROGRAMS LIKE PUPPY CULTURE, AND TRULY UNDERSTAND THEIR BLOODLINES!! Also, some breeders are not able to provide AKC and/or ASCA papers. Even if you are buying "a pet" puppy you should get the registration or application papers, as it's part of an assurance of quality (but not the only one.) Definitely don't pay many hundreds of dollars for a puppy from parents with no hip or eye tests done, and that is only registered with groups like NSDR, CKC (Continental Kennel Club), APRI and such. You can read more about that on my "Registries and Papers" page. Even if you only want a puppy as a pet or companion, you may as well get a good one as it's a huge investment in time and emotion. I personally wouldn't want a puppy who doesn't have AKC and/or AKC and ASCA papers, and comes from parents who don't have any OFA/CERF and other health testing. Some of them may turn out okay, but it is a lot more of a gamble since the breeders may not care about doing everything they can to produce really good quality puppies.